Singh helped carry the coffin of a slain CRPF jawan before it was flown out of Jammu and Kashmir in a special aircraft. 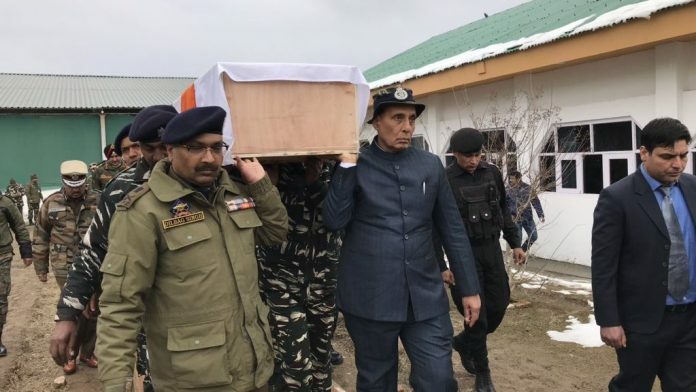 Srinagar: Home Minister Rajnath Singh Friday helped carry the coffin of a slain CRPF jawan after he laid a wreath on the mortal remains of the troops, who were killed in a terror attack in Jammu and Kashmir, officials said. Shortly after arriving from Delhi, the home minister attended a solemn function here where the remains of 40 CRPF personnel were kept in coffins, draped with tricolour. Singh helped carry the coffin of a slain CRPF jawan before it was flown out of Jammu and Kashmir in a special aircraft, an official present at the function said. The home minister, Governor Satya Pal Malik, Home Secretary Rajiv Gauba, CRPF Director General R R Bhatnagar, Jammu and Kashmir DGP Dilbagh Singh besides others attended the wreath laying ceremony. “The nation will not forget the supreme sacrifice of our brave CRPF jawans. I have paid my last respects to the martyrs of Pulwama. The sacrifice will not go in vain,” Singh said. The dignitaries stood in silence till the coffins were loaded in a truck which went to the Srinagar airport, the official said. The bus was part of a convoy of 78 vehicles CRPF travelling from Jammu to Srinagar.